I’m loading loose groceries into a tiny, ancient rental convertible and waiting for some guy to bring me paperwork so I can leave. Apples roll into the front passenger side, smooshing a shrink-wrapped pack of sausages. I check the time. 6:45am, the same time I’m supposed to meet my sister for the race. I still have a two-hour drive ahead of me. Where is that guy with the paperwork? The nice thing about built-in alarm clocks is they have the opposite of a sleep function. At least mine does. That’s when you wake up before the alarm is set because your subconscious doesn’t trust real alarm clocks on account of not using them much. I imagine a mostly unused alarm clock might be passive-aggressive when it comes to big events. Plus I’m not sure I even know how to set mine properly. There’s no taking chances when you have to meet a group of people two hours away at 6:45am on a Sunday morning and you have the parking pass. The rental car dream was a big red flag, so I got up before the alarm did or didn’t go off and I went downstairs to make coffee and mentally prepare for the big 10K. A 10K is 6.2 miles, which I’d run a half dozen times since late August. My favorite run was also the first one I did along a flat and shaded roadside to an abandoned watchtower on the Delaware coast. On all my practice runs, I paused my running app so the clock wouldn’t roll while I snapped pictures, a hobby that paired nicely with running this summer. This was the summer of running for the enjoyment of it. Actually, I forgot that I wasn’t going to call it running anymore. I jog. What happened when I went out for sporadic, leisurely jogs and left the timing gear at home was I got slower. Like, a minute-a-mile slower. I started tracking my pace again around the time I started 6 mile practice runs, but I never got faster. I was nervous going into this race. The night before, we all got an email from the organizer that basically said “Look, we better tell you right now: expect long lines and delays. In case you didn’t know, you’re not the only one doing this race. You’ll be running with 20,000 other people. Twenty thousand. So take off the crown and just show up and enjoy yourself.” I thought it was the kind of email that might be helpful to get every single morning. It turns out, the race was extremely well organized. I met my baby sister and her running buddies right on time and we parked at the nearest shuttle stop and were whisked off to the start line. 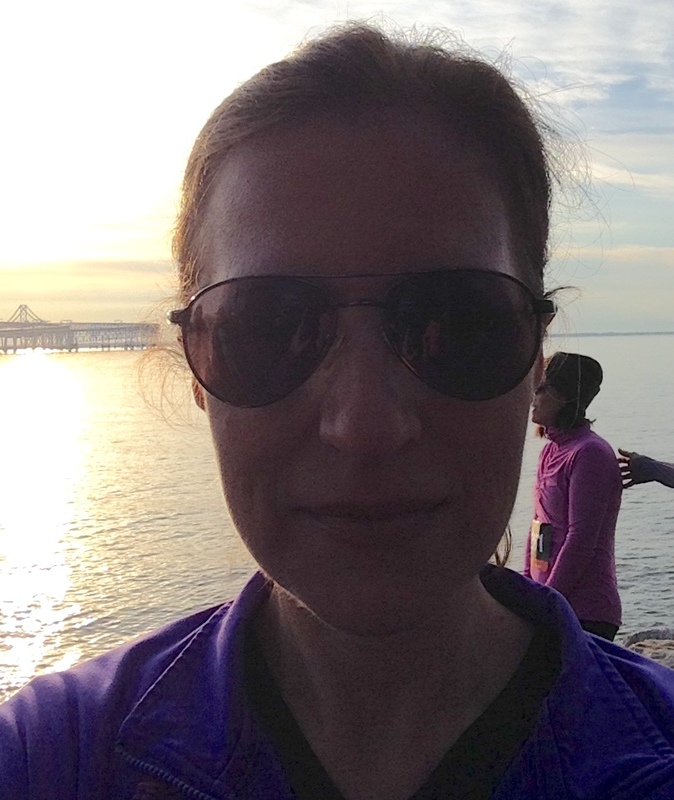 Here I am in the only pair of sunglasses I seem to have left after summer, with the stunning Bay Bridge in the background, plus what looks like an unsuspecting woman getting ready to take a swim. 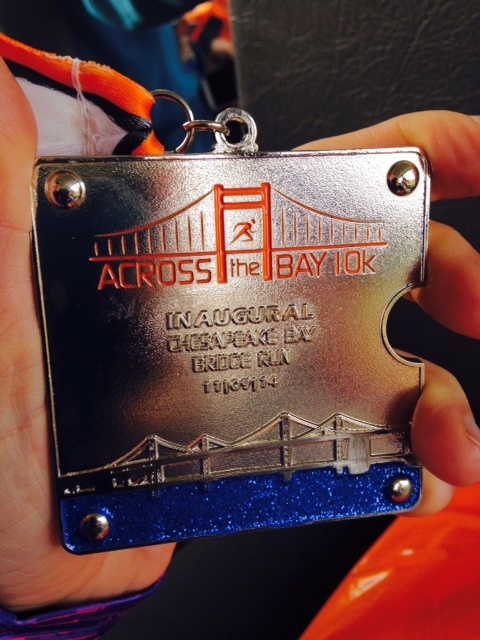 The course was 4.35 miles of bridge, plus some mileage before and after to make up the 10K. The bridge part was absolutely amazing. At the midpoint, we were hovering 186 feet above sea. There were telephones and sobering signs for a suicide hotline. My sister said she looked over the side at the top, but I didn’t dare. We were so close to heaven. This is where I hit my peak, the part in the run where I felt strong enough to keep going to the finish line and maybe forevermore. Then mile 5 came. For some reason, I was still chewing gum I’d had since the drive down. I didn’t want to throw it over the side of the bridge and hit an unsuspecting seagull, and suddenly this old gum felt like an albatross, a real liability I was lugging towards the finish line. My mouth was desert-dry and I a little panicky. This is where I wanted to walk so bad. Then a song came on my playlist that made me keep going. I happened to be jogging alongside an airport with grounded planes that were “flying” faster than me, so I got a case of the chuckles, which are like giggles for delirious, tired people. Then trying to remember where it all began brought it home. Awhile back, I wrote about how driving across the Bay Bridge in the worst hungover state of my life indirectly, and not until many months later, led me to remove the demon alcohol from my life. Running over it sober, healthy? This was a big deal for me. I did remember where it all began and in that moment I was like “okay Universe, thanks buddy” and kept dragging towards the looming hill and heaven. I got this when I crossed over. The finish line, I mean, not heaven. Maybe they give medals in heaven too, not that I’ll probably find out. I had the best cup of coffee in my life after the run. I got a space blanket, which I thought they only gave out for marathons, but I took mine because a 10K is as close as I’ll get to running a marathon. The coffee wasn’t free, but luckily I’d brought a twenty dollar bill in my running belt. Remember the post where I shared the preachy, tragic short story I wrote when I was 11? Well, it almost came true. While taking out my phone at the 1.5 mile mark to take a blurry picture of my feet or something, my precious $20 fell out! Now, I might let a $5 spot go, but not a $20. I nearly took out two unsuspecting runners in a mad scramble to pick it up. I feel really bad about that part and only later did I make the connection that I very nearly died, just like 11-year old me predicted. So the run is over and I had such a wonderful time. It was amazing and empowering and all the things I’d hoped it would be, despite the race organizer’s low-expectations email. The best part was getting to spend time with my sister, who I don’t see nearly enough. After the race, we cleaned up and went to lunch at a fun place on the water with her husband and sweet baby boy. These are the precious moments, you know? This is what life is all about. Oh I enjoyed reading this one BBB. 🙂 Witty, endearing, inspiring with coincidences that seem like messages from the Universe. Brilliant. Congratulations on your 10K! Oh my God, this post makes me want to go for a JOG right now! Kristen, I am so proud of you, reading this gave me such a shot of energy (to which my stupid sprained ankle is saying, “easy now”). Thanks for sharing this, and I hope that medal is going to a prominent place in your home! I’m really bummed to hear about your ankle – rest and take it easy! Joe hung the medal in a prominent room in the house. Made me very proud. Where’s the ‘love’ button? I love you’ve come full circle on this bridge and that metal is pretty darn cool. Congratulations for thriving through your race! I guess these full circle moments happen a lot in life…this was a fun one to write about. And thanks! I’m jealous…I love runs on the water:) And loved reading this it made me smile this morning. Thanks! Congrats on your happy across the bridge run! 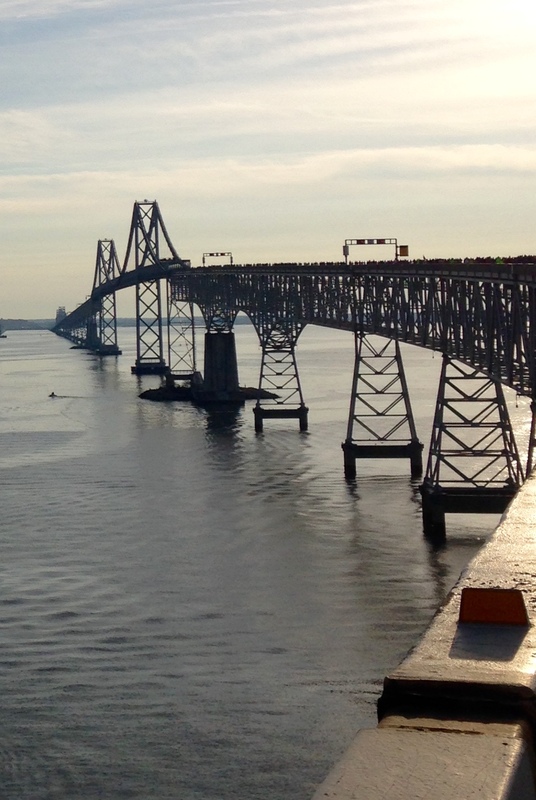 That bridge is in my neck of the woods, –and I’ve been on the mailing list for the race. I don’t run, yet. Maybe next year. Congratulations! You’ve probably seen they’re offering an early sign-up spot for next year’s run. I overheard someone say they hope to expand it next year, which doesn’t seem like it would be a problem as long as they have the same organizer in place. It ran seamlessly from my perspective. There were a lot of walkers too. You just had to be able to do a 19 minute mile. As for running, I started with couch to 5K and would recommend it if/when you’re ready. Walking is great too, though. Hey, I did not know about the early registration but apparently the early spots are already taken. I also did not know it could be walked! This gives me an incentive for next year, thanks! Oh YAY! I was hoping to hear the story behind your race. What a beautiful, grateful and honest perspective. I loved every moment of it. I’ve officially added this to my bucket list of races to do…as soon as this danged knee lets me. I’m just going to take my jacket off *pause* snap a few pictures *pause* *pause* Wow, my best time yet! This is my preferred way of running, naturally. It’s part exercise, part stopping to smell the roses. I TOTALLY agree! In fact, I haven’t dug out my running watch in a really long time. Something liberating about being freed from the time tethers, no? I’ve been thinking about your post all morning…you helped me remember why we run in the first place. Thank you, Kristen!! Sure is. I may go back to not timing runs. I have one I want to do with my daughter(s) next month, but after that might ease back. Last winter was really rough on getting out on the first place and I remember feeling so guilty about it. I hope your knee heals and that you get out in a way that feels good for you!. So happy for you. Loved every bit of this. Except where you almost made your 11yo story come true, though I did laugh at that part, um, sorry? Aren’t shuffled universe songs the best? I can’t thing of any better fitting song. I got chills during my marathon when Shake it Out came on at the end when I was almost dying. As opposed to one of my training runs when I asked the universe for a sign and the song that came on? I Like Big Butts. Ha! The universe is smart, yes, but also has a good sense of humor. Congrats on an outstanding race and a phenomenal day! Haha! That’s great, and it really is. We were all trying to figure out what the shape was. One woman theorized it’s a replica piece of the bridge, a plate or whatever it’s called. Oh I love this. My very own piece of heaven. Yay for you! I ran a 10K. Once. I’m not ashamed to admit that I walk part of it, or at least, ran so damn slow it was practically walking. But I finished, and I was glad I did it. I also realized there was no euphoria in running for me. So I stopped. I’m a walker. Love walking. Also, the thought of running 4-plus miles across a bridge that high was scary just reading about it. That medal you got — TRULY a major award!! And well earned. I am delighted for you. Woo Hoo! 10k done and dusted. Awesome post and effort there, Kristen! 10K ain’t no walk in the park! I need to sign up for one. I have never run one. It’s a tough distance – it’s a sort of very long sprint (not for me!) And to do it on a bridge – very cool! And hey – don’t feel bad about the $20. I lost my credit card just past the finish line after my last race trying to fetch my phone or something stupid like that (why I chose to get my phone out then and there is a mystery). But ya did it! And of course the full circle thing is pretty groovy. I too love the shuffle thing. I usually pick a whack of songs I like and know I won’t skip and then let the universe take it from there. Congrats on the bling – love it!! Congrats – big achievement – well done. Yay! Congratulations! What a beautiful scenery. I agree with everyone else, this post was awesome amd inspiring. Made me even happier to have ran my 3 miles this morning. Good job! Congratulations~ sorry the wishes are so late! I knew you could do it! Your so nice to the seagulls~ saving them from your gum! Glad to hear your weekend went well! Hugs! also so spooky cool to hear that song came on and how it all fit in – so nice – really nice. and regarding the songs, well the last 5 k we did was a turkey trot a couple of years ago – and it was a literal party afterward because they had so much free food and everyone in our party won something from the raffle. The event is not longer like this – it was a “newly” organizing it and well, she had some lessons to learn with going all out – ha – but it was great to stay and feast and wait for raffle numbers. anyhow, nobody brought music with them – even though I do like music – and I could relate with what you wrote about being energized by the right song at the right time – and for me – I was running alone for part of it and when I felt like walking – there was a song in my head that I started singing that always gives me a surge. and the funny thing is that it is the most unlikely song – it is wanted man by Ratt – lol – and the drum part is in my head – and you think it would be a song like “I need a miracle” or a dance jam like “jam on it” -but this old rock song from ’87 is in the brain and singing it just helps. so funny.